Proletarian literature, the realistic and often angry novels of the 1930s that chronicled the hardships of common people during the economic collapse, has become one of the best sources of understanding the human dimension of those troubled years. While it contains a vast body of works, the Proletarian movement produced few works of enduring excellence. 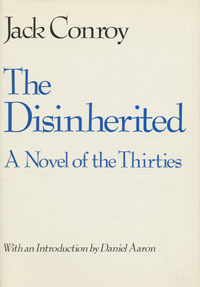 Perhaps foremost among those it did produce is Jack Conroy's The Disinherited. Despite the fact of an extensive and variegated literary career, Jack Conroy's reputation is associated primarily with his first novel, The Disinherited...It was obviously autobiographical - indeeed, Conroy had written it as an essay in autobiography originally, only later and by order of his publisher transforming it into fiction. The hero of the novel is the son of a coal miner, and therefore he is of the family of America's "disinherited." He tells the story of his boyhood in a company-owned coal town, and then the story of his young manhood during the first years of the Great Depression, spent pursuing laboring jobs and wandering when there are no jobs. All of his experiences present evidence of a conspiracy against ordinary workers. The novel was almost unimpeachable: it was written by a genuine proletarian, it touched upon all of the proper themes, and it ended in polemic. Conroy's book secured great reputation for its purity. It has remained a primary document of the social literature of the 1930s.